The Kingdom Protista includes diverse kinds of predominantly water-dwelling unicellular eukaryotic microorganism. Protists, like Monerans, have an immense reproductive potential. In an optimal environment, they may reproduce several times a day. This is mainly by asexual reproduction, using the process of mitosis. However, they also reproduce sexually. Protists reproduce sexually by a process involving cell fusion and zygote formation. During sexual reproduction, two cells fuse and their nuclei, their chromosomes and usually cytoplasm combine to form a new cell, the zygote. The process of fusion of haploid cells is called syngamy or fertilization. Meiosis, a requirement of sexual reproduction, either follows or precedes syngamy. 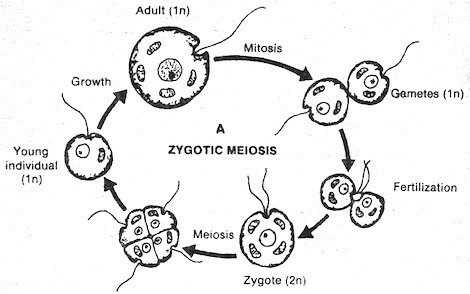 Protists normally Haploid (1n), in their adult stage exhibit zygotic meiosis during sexual reproduction. the haploid adult produces two haploid gametes by mitosis. pair of these gametes then fuses during fertilization to produce a diploid zygote. this zygote then undergoes meiosis to form four young haploid individuals which grow into adults. Protists which are normally diploid (2n) in their adult stage exhibit gametic meiosis during sexual reproduction. 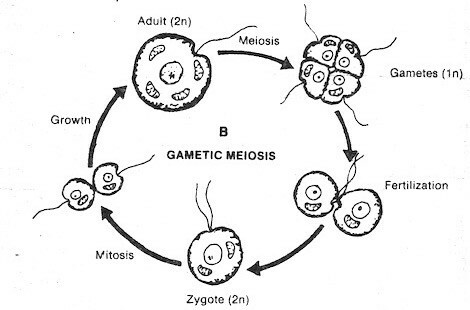 diploid adults produce 4 gametes by meiosis. gametes fuse in pairs (fertilization) to form a diploid zygote (2n) which grows into a diploid adult. 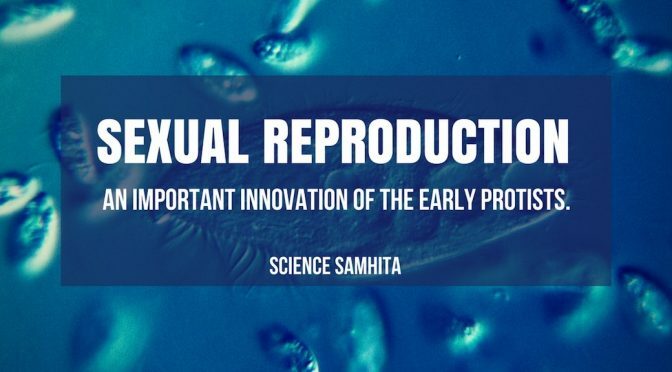 Like the development of the flagellum for movement, sexual reproduction in protists involving meiosis, syngamy and zygote formation appears to have been a major evolutionary innovation by the primitive protists. This innovation has made a profound effect on more complex organisms. It is generally believed that rapid evolutionary advancements made during the 1 billion years of eukaryotic existence were made possible by sexual reproduction. This is because the process of sexual reproduction allows greater variation in the progeny than asexual reproduction by meiosis. Sexual reproduction and the associated genetic recombination also provide a means for mixing of genes. Gilbert, S. and Barresi, M. (2016). Developmental biology. Sunderland (Mass. ): Sinauer. Previous Post​Why are some fungi grouped under “fungi imperfecti”?Next PostMesozoic Era – the Age of Reptiles.